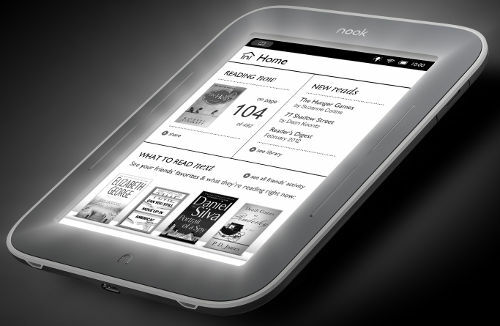 Barnes and Noble has started shipping out their new Nooks with frontlit screens a week earlier than expected. They did the same thing with the Nook Tablet so that’s not surprising. Initially the Nook Glow was slated for a May 1st release, but display units have started arriving in some stores this week and now pre-orders are going out too, so it’s good to see it arriving early. However, on Barnes and Noble’s website they’ve changed the date the Nook becomes available from May 1st to May 7th for pre-orders. Maybe they’ve got a backlog of orders. You might have better luck finding one in stores before then. Update: Some folks are getting shipping notices today for new orders. B&N officially announced they are shipping the Nook early and that stores will have demo units but limited stock on hand, and advise “For those who would like to give NOOK Simple Touch with GlowLight as a gift for Mother’s Day, we strongly recommend pre-ordering the device now in stores or online as we will have very limited quantities based on the larger-than-expected order volume we’ve received so far.”. In case you missed it, the Nook Touch with GlowLight is a 6″ E Ink ebook reader that is 90% the same as the original Nook Touch, but it has an LED frontlight built into the screen for reading at night. The light can be turned on and off and the brightness can be adjusted. I received a shipping notice for the new Nook last night, and it is expected to arrive later this week. I’ll post a video and first impressions review by the weekend. Subscribe to keep updated! Great news, I hope to see a review soon ! You got a notice, too? Good. Glad for the confirmation. I just pre-ordered last night and got an email stating a projected ship date of today (24 Apr). Sweet! It looks like the colored border is grey, not white like the Black Friday special edition Nooks! I can’t wait to see the review Nathan. I am most anxious to see if the “invisible” light layer over the screen is really invisible, and doesn’t effect text contrast during the day. I just got an email (9:05pm PST Tue 24 Apr) from B&N stating my Nook Glow has been shipped. Woo hoo! Free shipping too (but steep sales tax here in CA). Yeah, I’m having problems trying to decide what to call the darn thing when writing about it. B&N’s idea of a name is more like an awkward sentence. I think I’m going start calling it the Lighted Nook Touch. I don’t know. That sounds kind of lame too. Nook Glow is okay, but it makes one think of that green color of glowing objects and that’s not really accurate because the light isn’t green at all. Other than that, it’s the same ole hat. Worth the $130? Yup! The light just makes for a really complete product. If only this thing supported audio…. Great first impressions, Cloudman! I can’t wait for mine to show up tomorrow. That seals the deal, Cloudmann. Your review is so good it’s getting its own post :).